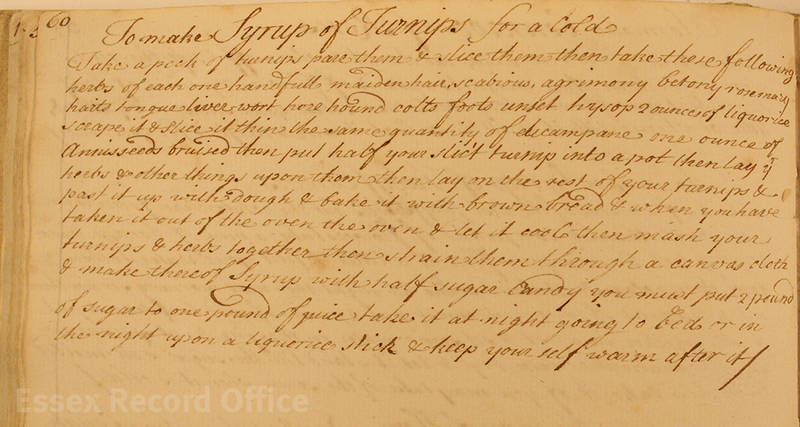 An unseasonably soggy August day seemed a good opportunity to share Elizabeth Slany’s recipe for a ‘Syrup of Turnips for a cold’. With a total of 13 ingredients added to the turnip and then plenty of sugar added at the end, this sounds like an elaborate cold remedy, and would presumably have been out of reach of most ordinary people. If you have other historical cold remedies do leave them in the comments below; hopefully we won’t need them as summer wears on but it might be best to be prepared.